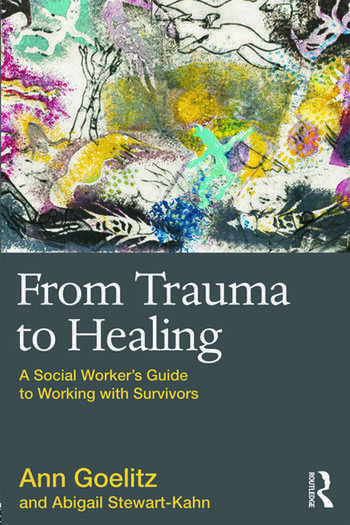 From Trauma to Healing: A Social Worker’s Guide for Working With Survivors is the next significant publication on trauma in the field of social work. Since September 11 and Hurricane Katrina, social workers have come together increasingly to consider how traumatic events impact practice. From Trauma to Healing is designed to provide direction in this process, supporting both the field’s movement towards evidence-based practice and social workers’ growing need to be equipped to work with trauma. It does so in the practical-guide format already proven to be compelling to social work students, educators, and practitioners, providing case examples, and addressing social workers’ unique ecological approach. Ann Goelitz, PhD, LCSW, is a social-work educator and trauma psychotherapist who has done extensive public speaking, published numerous articles, and co-authored an award-winning resource directory for caregivers. Abigail Stewart-Kahn, MSW, LCSW, is a social worker focusing specifically on intimate partner violence and childhood exposure to trauma. She has worked directly with children and their families and in innovative program development and prevention.